Ever wonder why Americans started making whiskey? Our friends over at Spodee Wine have a delightful dose of cocktail history. Like the red Spodee, the new white variant is also 36 proof and harkens back to the Depression era hooch of the same name, that was a deceptively strong, sweet, easy-to drink beverage. Spodee White is a white wine that is fortified with moonshine and mixes easily into cocktails, just like a spirit! 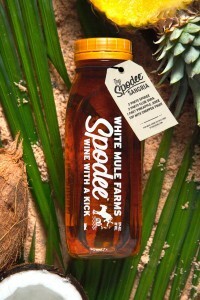 Spodee White is great served chilled or mixed into a citrusy cocktail or sangria, No matter how you drink it, Spodee is reinventing the way people enjoy wine. “I pioneered high proof spirits when I introduced 92 proof Sailor Jerry Rum. Now I am pioneering high proof wines….or low proof spirits…depending on how you look at it.” says creator Steven Grasse. For more information, visit: www.spodeewine.com or click here to find a retailer near you, plus keep up with them on Twitter, Facebook, and Instagram.